Looks a beautiful sunny day, here in this bike pic we captured a biker chick peacefully riding a cargo bike, from Amsterdam, with her child inside. This picture was captured on a picture perfect day riding across Iowa on RAGBRAI 2018. 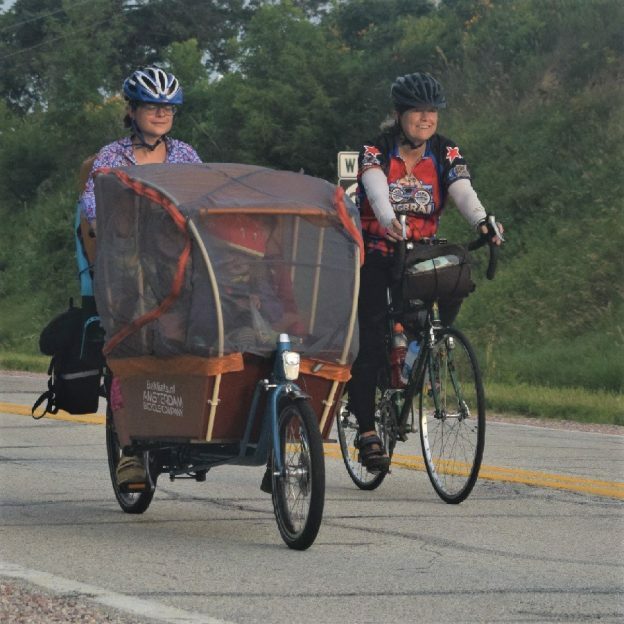 This entry was posted in Picture of the Day and tagged Across Iowa, Amsterdam Bicycle Company, bike guide, cargo bike, family memories, Free maps, Iowa, picture perfect, RAGBRAI, ride right, road biking, tandem bike, touring on September 6, 2018 by Russ Lowthian. There was a consistent buzz throughout the week of Interbike and part of the high was the hum of some of the best e-Bikes out there. E-bikes have become big business in the biking world and for good reason. With the baby boomer generation aging, but refusing to slow down, there is a real need for motor assisted bicycles. 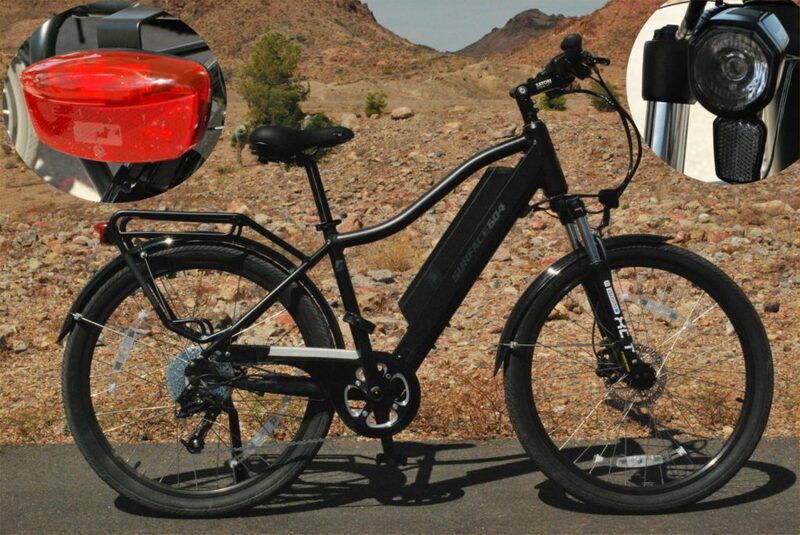 E-Bikes offer extended range by giving the rider a boost of power when things get tough. Keep in mind, most of these bicycles don’t have a throttle as a standard feature and only activate a motor when the going gets tough. Take a look at some of the best e-bikes at the show. 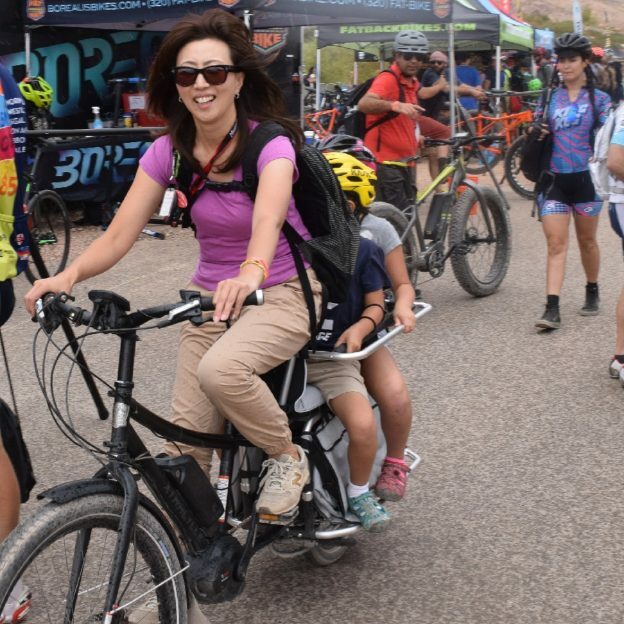 A welcome surprise at Dirt Demo was Surface E-Bikes. I spoke with Sam (the founder) for a while before testing out the bikes. Sam was a designer for a major bicycle company in Canada for years before having the impetus to start Surface 604. He knew that E-Bikes would soon sweep the nation, but saw a gap in the market where high quality/low cost bikes should be. Using his design and manufacturing experience he set out to fill that need. I’m happy to say I think he did it. The Rook is a trekking style bike (think hybrid with lights, fenders and a rack) designed to be comfortable and utilitarian. The bike rides well without the pedal assist and absolutely hums when the motor kicks in. The fit and finish of the Rook is every bit as nice as it’s more expensive counterparts and offers additional features that many overlook. In addition to the rook, Surface also produces the eye-catching Boar fatbike. It’s camouflage paint scheme and ability to go almost anywhere make it an ideal bike for any hunter or sportsperson. Where Surface focused on the cost conscious, Vintage Electric Bicycles went to satiate the most discerning riders. Just one look at their unique model line will have you begging to throw a leg over and fly down the road. 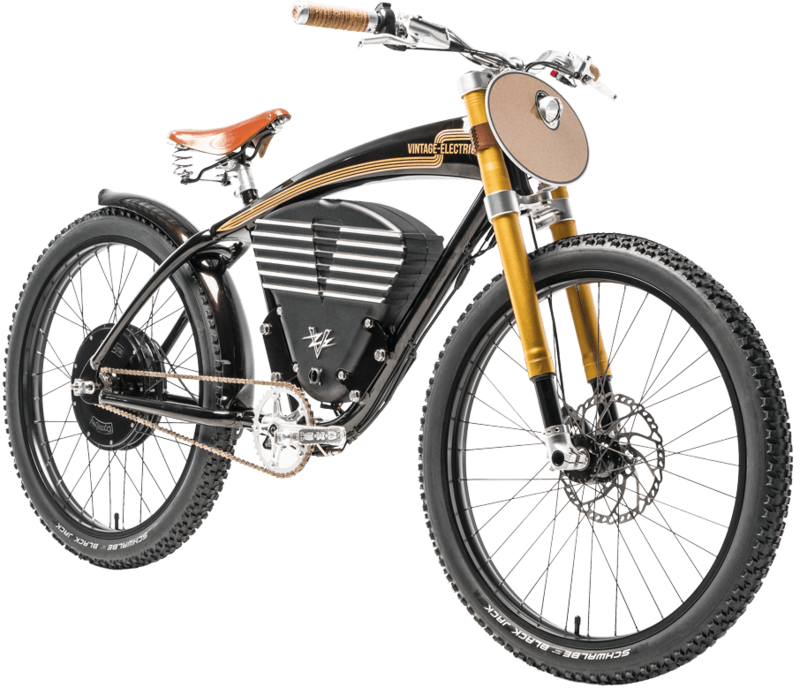 These E-Bikes are inspired by the classic style while boasting modern day technology. Great touches like die cast aluminum battery cases, make these bikes look like a custom café racer while elegantly storing the battery in a lightweight shell. Of all the bikes in their booth the Scrambler was the true show stopper. It seemed no detail and no cost was spared in making this modern day classic. Vintage Scrambler looks like it’s ready to take off! Focus is a bicycle brand based out of Germany. They are well known for their technologically advanced bicycles. Focus is also known for their bold and progressive paint schemes. When it comes to E-Mountain Bikes, Focus delivers on both technology and appearance. It was impossible to miss the BOLD2 with its clean lines and amazing appearance. Even though this bike wows you with its looks, the real story is in the BOLD2 ‘s function. 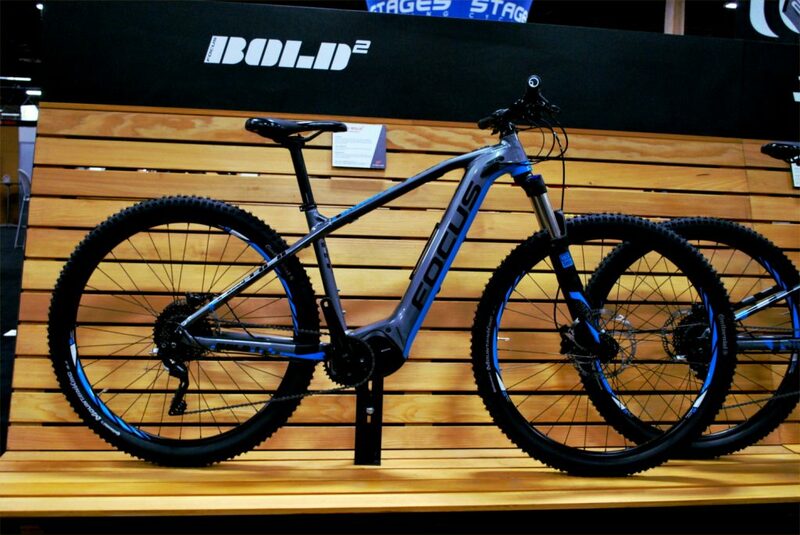 Focus armed this E-Mountain Bike with Shimano’s new XT motor system that is specifically designed for off road use. Additionally, they use a smart collection of parts to ensure you can tackle any trail and a beautifully hydro-formed frame to help keep the weight low. 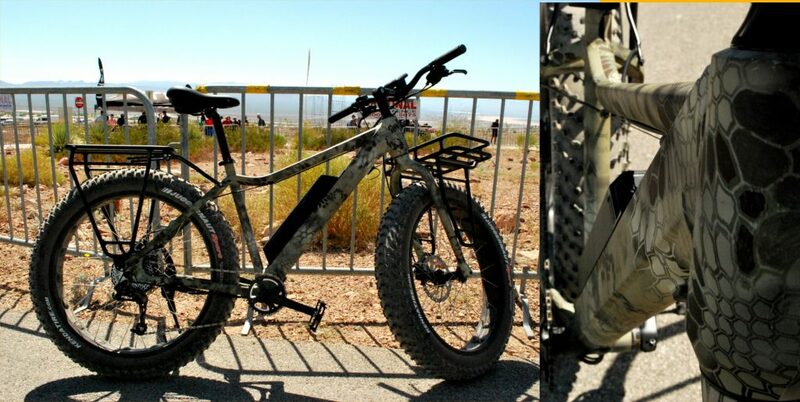 Best of all is that this bike can use 27+ wheels (that’s a 27.5×3” tire) guaranteeing all the traction you will need. Overall the best e-bikes on the market are still evolving with new brands and parts arriving daily. If these options are any indication of things to come, we are all in luck. This entry was posted in News and tagged #focus, #mountainbike, #mtb, best e-bike, best e-bikes, best ebike, bike, cargo bike, E-bikes, family friendly bikes, focus bikes, fun, mountain bike, surface, surface bikes, trekking bike, Vintage Bikes, vintage E bikes on October 6, 2017 by John Brown. Hi all! Day two at Interbike’s dirt demo brought more fun in the sun. It gave me an opportunity to review a load of new folding and E-bikes. It seemed any direction you turned, there was an e-bike waiting for you as Tern showcased its latest folding bike model, the GSD. Tern Bicycles is a relatively new company who burst onto the cycling scene a few years ago with a clean and hyper functional line of folding bikes. Over the past few years they have built a name for themselves through developing folding bikes that not only look great but ride more like a full size bike. In addition to making great bikes, their forward thinking design team has worked to solve problems that plague cyclist with limited storage space. Given Tern’s ability to make revolutionary products, I expected a lot from their new bike the GSD. Why GSD you may ask? Well, it stands for “Get Stuff Done” and given the wide capabilities of this bike, that’s exactly what it can do. You see, the GSD is what’s called a mid-tail e-bike. 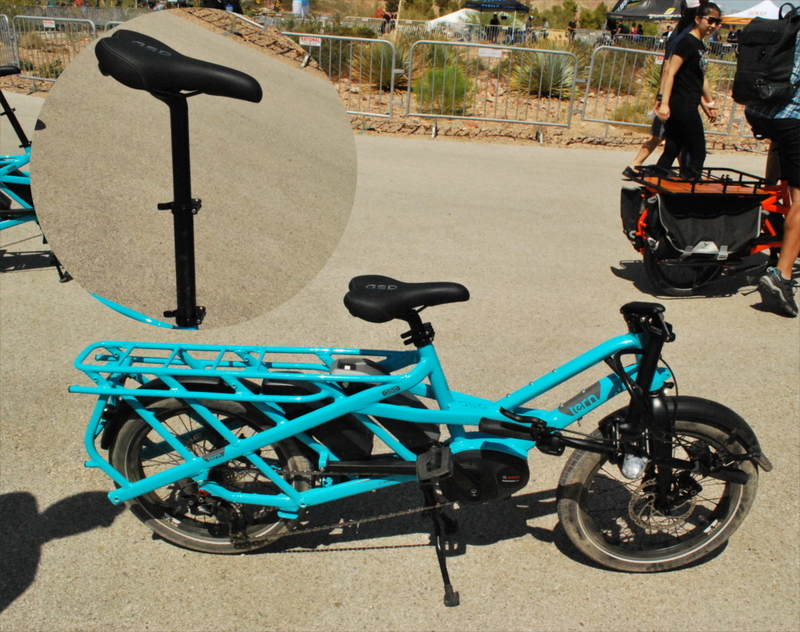 A Mid-tail bike has an extended rear triangle designed to carry additional cargo, people, or accessories. The typical problem with extending the rear triangle is that it can make the bike handle poorly. In the same vain, adding additional cargo to the bike makes pedaling difficult due to the weight. How Tern gets around these issues and to keep the overall length low is by using the same 20” wheel size as their other folding bikes. They also add folding features to make storage of the bike easier. On top of that Tern also equips the bike with a robust motor and dual battery capable of powering the bike regardless of how much weight is on board. If the GSD were just an Mid-tail ebike, it wouldn’t be that exceptional. However, it isn’t just any old electric assist bike. It seems that Tern has thought of nearly everything. To start, they have custom bags that mount onto the back, but if those don’t tickle your fancy, you can mount waterproof bags from Ortlieb as well. If it’s human cargo you want to carry, there are retractable foot pegs, and a cushioned seat that can mount to the back. As well as carrying people, the GSD also is available with cool stylized front and rear cargo baskets. The most impressive thing about the GSD is actually the ride and by that I mean how normal it is. Hop on, pedal away and you will immediately feel at home. The GSD doesn’t suffer from many of the idiosyncrasies typically associated with a mid tail bikes. There is no tiller feeling when you turn the bars. Additionally, the common feeling like you are dragging a trailer behind you is replaced by smooth, quick handling. Overall, the GSD is the most comfortable, maneuverable and capable mid tail bikes I have ridden. 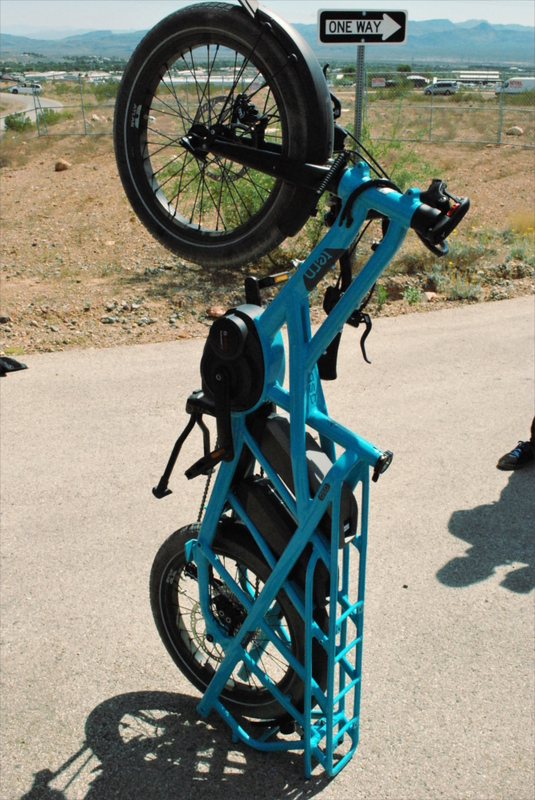 The GSD folding bike with the saddle in its lowest and highest (inset) position. Tern went a step further to make the GSD capable by adding an E-motor from Bosch to the bike. This motor helps riders power through their duties with speed and confidence. Considering that the GSD will most likely be loaded with more weight than a standard bike, Turn accommodates for a second battery on the bike to extend its range. While the “Get Stuff Done” model might not be for everyone. Although, it’s details, quality, and stunning ride quality speak volumes for the attention to detail, that Tern brings to all their bikes. Stay tuned for additional reviews of the amazingly well thought out Tern bicycles. 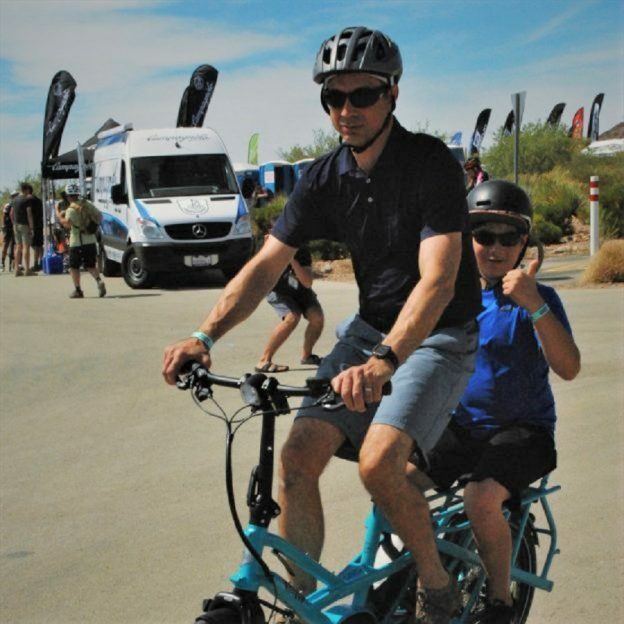 This entry was posted in News and tagged Bosch, cargo bike, child friendly bike, commuter bike, Dahon, e-bike, E-bikes, Folding Bikes, folding cargo bikes, Interbike, Interbike dirt demo, mid tail, Tern, Tern Bikes on September 21, 2017 by John Brown.